Milton Keynes Clinical Commissioning Group (MKCCG), the organisation responsible for ensuring that health and social care services provided are the most effective for the population of Milton Keynes, have revised their Low Priority policies following consultation with Milton Keynes University Hospital (MKUH) and public stakeholders. The revised policy, known as Procedures of Limited Clinical Value (PoLCV), can be found here. The policy has been implemented to ensure that MKCCG and MKUH utilise their limited resources in the most effective way and is part of a national initiative to ensure that local health authorities are providing the right care in the safest and most effective way. A PoLCV is a procedure where the clinical effectiveness is either absent or evidence shows weak efficacy. In essence, if a procedure is not clinically and monetarily feasible, this may be withdrawn from practice. 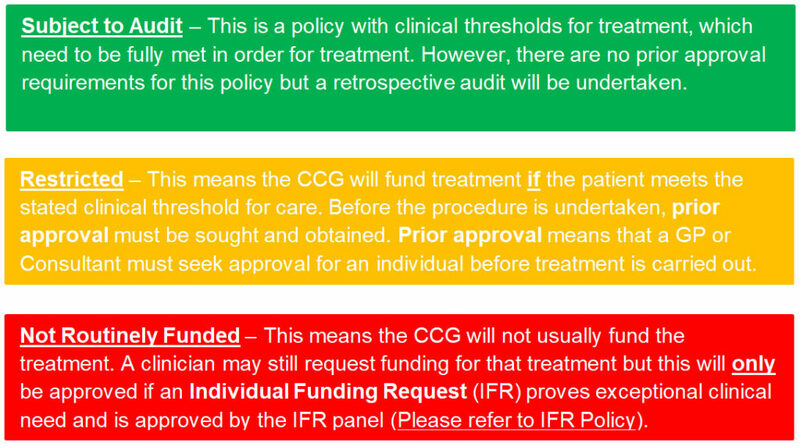 The policy outlines three different tiers, which have been categorised using a red, amber and green system. It is important to note that not all procedures will be affected by these changes and only those considered to be less effective may require further investigation. For further information, please visit the MKCCG website.